One of the jobs we had to do each evening was to walk down the railway embankment to the railway bridge, which was about two hundred yards from the station. 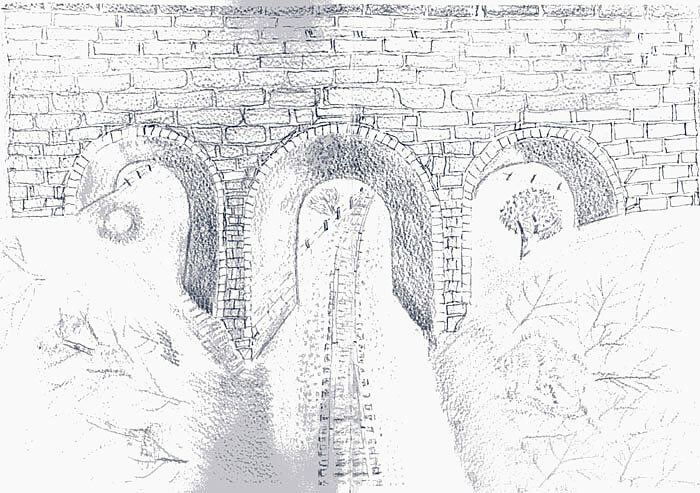 The bridge had three arches and under the left hand arch there was a small well, this was our only drinking water supply, our life's blood one could say, hence the title of the book. We carried a white enamel bucket of water each back home which were placed on a couple of stools in the kitchen. Edna used to arrive at the station every evening also to collect water and have a chat with Louie. Most of Grannie's time was spent looking after John, Maisie, Muriel and George. Aunt Louie done nearly all the baking and cooking. Uncle Eddie worked on W. Goodwins farm, at this time a short journey away. My other uncle John was married to Auntie Sarah who lived in a little cottage, with their daughter Edna, just the other side of the school on the Boley road. Uncle John was a ganger on the railway and was responsible for looking after a section of railway about three miles either side of Killyran Station along with another man called Bertie White.